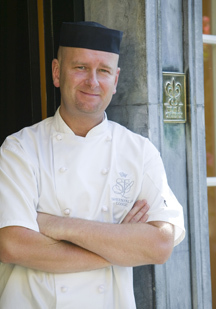 Dubliner Philip Brazil trained at the Dublin Institute of Technology before honing his craft at Tinakilly House, Clarence House, Knockranny House, The Clarion, and Sheen Falls Lodge. He describes his cooking style as "what you get out of the kitchen on a daily basis. I believe in cooking food the way that it deserves to be cooked and is respected, as some of our ingredients are expensive and have to be respected. All in all, I am an Irish man cooking in the South West of Ireland, keeping up with the goings on of the food trend throughout Europe and the rest of the globe." 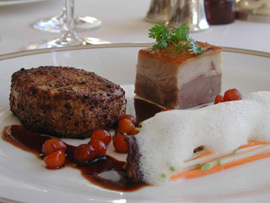 I stayed at Sheen Falls Lodge in September 2007 and had dinner at the award-winning La Cascade and was impressed with the innovative menu, which follows the seasons and changes four times per year. Inspiration for his menus comes from a desire to deliver to people what they cannot do at home, working with other chefs from around the world who bring new ideas, and delivering to the customers 24 hours per day to produce fine dining at La Cascade, for which he finds the challenge exciting. Asked what he would do if he was not a chef, he replied, "Believe it or not, I would be a Landscape Gardener, working out in the open, in the fresh air, and again creating new things from my hands and imagination." When not working in the kitchen, he can be found working out in the gym, enjoying days off with his wife, Fidelma, and cooking at home for family and friends which he considers good fun, when there is time to sip a glass of wine and have the crack (the Irish word for a fun evening) without the pressure. Method: Lightly salt both sides of the pork belly and leave for 4½ hours refrigerated. Then wash off and place on a roasting tray big enough that the duck fat will cover the pork. Warm the duck fat so that you can see that it covers the pork belly (if you are a bit short you may use a good olive oil), cover with aluminum foil and place in a preheated oven at 130° C (266° F) for 4½ hours. When it is cooked you should be able to pull it apart very easily, be careful not to overcook, but equally careful not to undercook. Let cool in the fat for an hour, remove from the fat and refrigerate. This is now ready for cutting; cut to a 120-gram portion (4.2 ounces) nice and square, and keep the trimmings. Method: Using a Parisian baller scoop out the sweet potato about 10 balls per portion. Blanch the sweet potato for 2-3 minutes and refresh in iced water. Repeat the scooping with the apple, but put the apple into some lemon water to stop it going black. Heat a small pan, add the sugar and bring it to caramel, add the apples and potatoes. Gently move the pan to color all of the apple and potato adding 5 grams butter to finish and glaze. Method: Shred vegetables on mandolin; add some pickling syrup and a teaspoon of organic sesame oil. Method: Bring all ingredients to boil and then add Shitake Mushrooms and simmer for about 10 minutes; cool, leaving the mushrooms in the syrup. Method: Sweat the onion and butter without color. Add the milk to the onion mixture and bring to boil. Then add the peanuts to the milk and simmer for 20 minutes. Lightly break up the peanuts with a food blender (no not liquidize), leave to infuse for up to two hours. Then strain and reheat before serving, frothing with a hand blender. Method: Sweat the shallot and garlic, brown slightly and then add the Five Spice Powder. Roast for a couple of seconds, add the sugar and caramelize, and add the red wine vinegar to finish the gastric. When almost reduced, add 100 ml (3.4 ounces) of veal stock, bring to boil to sauce consistency, season accordingly, and pass through muslin; this is now ready to serve. This dish is easily put together, when all of the above is made, so let us begin. Method: Preheat frying pan and dust the pork with the cep powder, sear the pork well having it well seasoned beforehand. At this point place a nice square of pork belly skin side down in the pan, place in preheated oven 180° C (350° F) for 5 to 8 minutes until it is medium to well done about 68° C (154° F) and the pork belly is crispy; if not leave the pork belly for another 5 minutes. While the pork is cooking, warm your shitake mushrooms in a small bit of the syrup, arrange neatly in a line and place the Mooli salad on top. Now add your caramelized apple and sweet potato balls beside. Then heat both sauces and have a small soup gun ready for frothing. Place the pork belly at the top of the plate and the loin below it. Spoon the sauce around lightly and spoon the froth over the salad. Serve immediately. Please read other articles on Sheen Falls Lodge in the Hotels and Resorts and Restaurants sections. Please read other articles on Ireland in the Hotels and Resorts, Restaurants, Chefs' Recipes, Liquor Cabinet: Celtic Crossing Liqueur, Boru Vodka, Knappoque Irish Whiskey, Fashion, and Adventures sections.